E. phyllanthes was first described by G. E. Smith from Sussex, England in 1852 and since that time several variations have been formally recognized. These varieties are however the subject of a current and ongoing Europe wide debate as to their true status. The situation in England is becoming clearer and it looks likely that there will soon be a reduction, possibly a radical one, in the number of varieties recognized. At the time of writing however there has been no firm guidance and we will continue with the current understanding of the position which is that there are four British varieties namely E. phyllanthes v vectensis, E. phyllanthes v cambrensis, E. phyllanthes v degenera and the variety described here, E. phyllanthes v pendula. Pendula was discovered by Charles Thomas whilst walking on the Ainsdale dunes near Southport, Lancashire in July, 1941 and it was initially regarded as a full species (E. pendula). 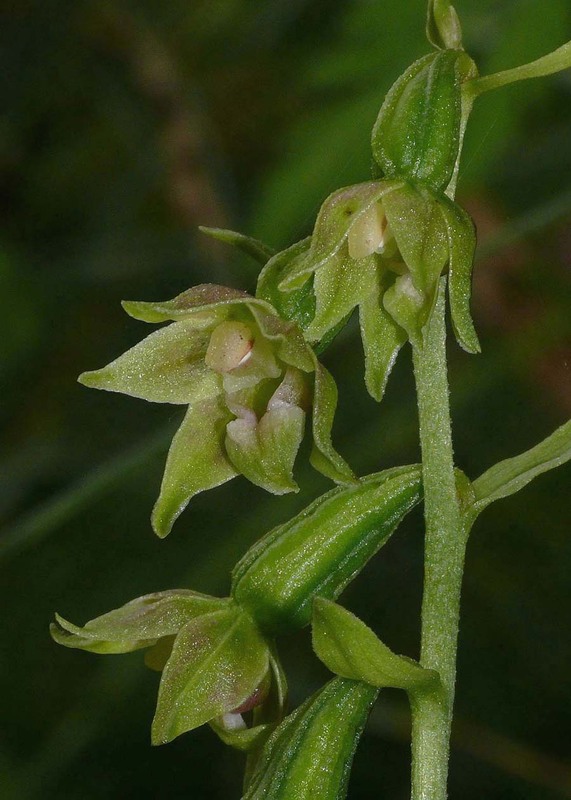 Subsequent studies linked it closely to other Epipactis species and most importantly to the Isle of White Helleborine, E. vectensis. In recent times however both this species and E. vectensishave been reduced in classification to varieties and it would seem that their status is destined to be reduced in significance still further. As long ago as 1962, D. P. Young noted that "there is no material dividing line, either geographical or morphological, between var. pendula and var. vectensis and the names are retained only for the convenience of description". The distribution of var. pendula was at first thought to be northern but it is now known from other areas and not least the dunes of South Wales where in one particular system it can be found growing in close proximity to both var. vectensis and var. cambrensis. It is recognizabe by its robust size (in all parts), fully opening flowers, pink and red textures in the flower colouration and finally the heart shaped epichile.